A Magical Mickey in Gorgeous Gold! It sounds unbelievable, but in 2018, Walt Disney's Mickey Mouse will be celebrating his 90th birthday. That's almost a century of this iconic character! It's true that the mouse has come a long way, but to really appreciate how rapidly Mickey became who he is today, just take a look at the masterpiece "Fantasia" which debuted in 1940. It took only twelve years for Mickey to transform from a monochromatic and barely audible creation to a talkative, personable and lovable hero in vivid color and motion. If shorts like "Steamboat Willie" turned Mickey into a star, his turn in "Fantasia" made him a legend. 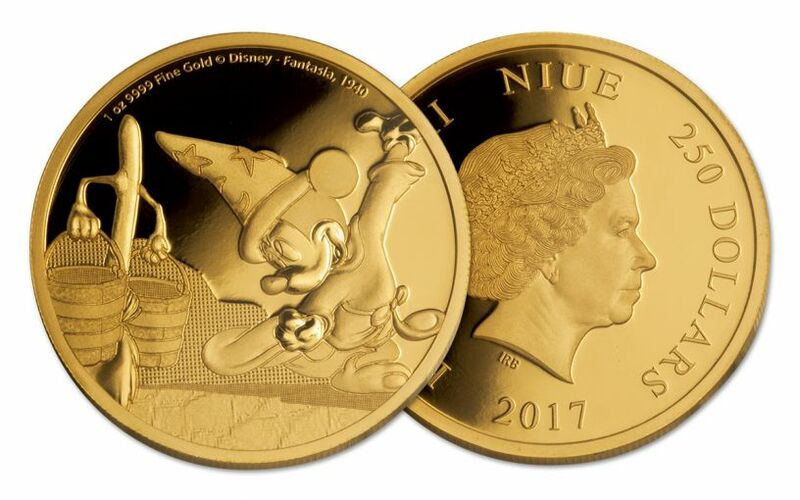 To celebrate the role that defined Mickey Mouse for generations to come, the New Zealand Mint is introducing this fourth release of the Mickey Through the Ages series featuring the "The Sorcerer's Apprentice" from "Fantasia." Like all the other pieces in the critically-acclaimed and audience-beloved "Fantasia," "The Sorcerer's Apprentice" is animated to a single piece of orchestral music -- in this case, the titular symphonic poem by French composer Paul Dukas based off of the poem "Der Zauberlehrling" by Johann Wolfgang von Goethe. In it, Mickey is an apprentice who, like many before and since, has to perform chores while learning under his master Yen Sid. However, when the Sorcerer leaves, Mickey takes advantage of his absence. Using Yen Sid's hat, he brings an ordinary broom to life and teaches it to do his water-carrying chores. After setting the broom to work, Mickey dreams of being a grand sorcerer of the sea and air. When he wakes up, though, he realizes the broom doesn't know when to stop! Amidst the water, Mickey panics and chops the broom to pieces. But, that only makes things worse -- turning the situation into a nightmarish situation of whirlpools and water. What happens next? If you don't know, we're not going to ruin it for you! 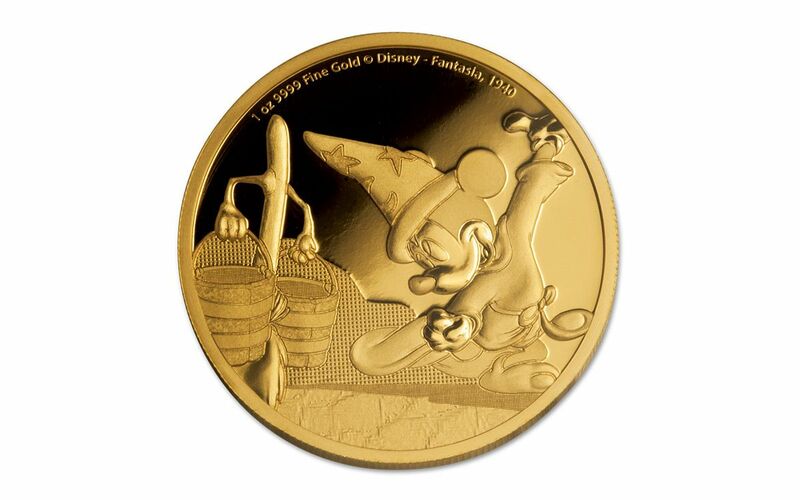 Struck in one ounce of 99.99% pure gold by the New Zealand Mint, your officially-licensed Mickey Mouse Fantasia Proof shows Mickey as he trains the broom to do his work while dancing to Leopold Stokowski's expertly conducted score. In addition, all of the coin's weight and purity details are engraved above Mickey's head, along with the Disney copyright, film title and release date. 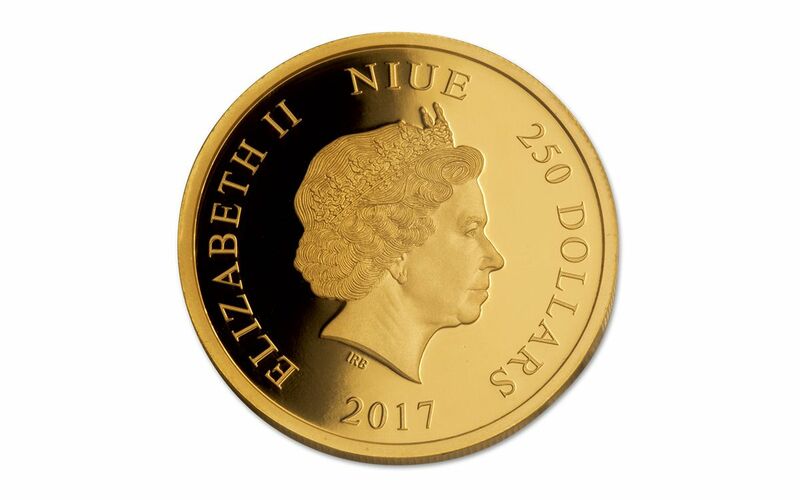 Flip this legal tender coin over, and you'll find Ian Rank-Broadley's portrait of Her Majesty, Queen Elizabeth II along with the date and denomination of 250 dollars Niue. Your Gold Mickey Mouse Fantasia Proof will arrive to you in the New Zealand Mint's original themed packaging --exactly as it was issued! You'll also receive the mint's numbered certificate of authenticity. Previous proofs from this beloved series have been flying into collections all over the world. With a limited mintage of only 500 for these Gold Fantasia Proofs, we expect our supplies to disappear from our vaults shortly after they arrive! Whether it's an addition to your coin collection, your stash of gold or your Disney treasures -- even as a beautiful gift -- don't wait to conjure up this proof for your own. Order yours today!